We can design and print for you a unique service booklet. 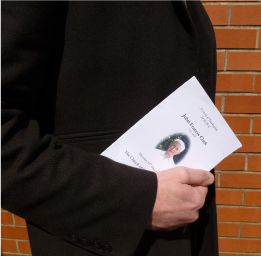 Personalised for your family, they can include photographs, poetry, hymn words and the general order of service. These are a relatively inexpensive keepsake for your guests to take away. "To Peter, Mervyn and Staff, thank you for your comforting support and excellent funeral arrangements..."
"Thank you for your utmost professionalism and personal kindness during this very difficult time...."